The Wooster Community Hospital Auxiliary serves a critical role at WCH through its fundraising efforts, community programs, and recognition awards and events. Free Valet – Patients and visitors to WCH can enjoy free valet parking, thanks to the contributions from the WCH Auxiliary. It is available Monday through Friday, 6 am – 4 pm. For valet service, use the main entrance on Winter Street, travel down the main drive and leave your car under or near the main entrance carport. Exchange your keys for a valet slip. At the end of your visit, provide the valent with the slip and he/she will retrieve your vehicle. Medical Alert Device – A 24/7 personal emergency response system that allows you to live alone with confidence for a nominal monthly rental fee. Medical help from WCH health care professionals is only minutes away. 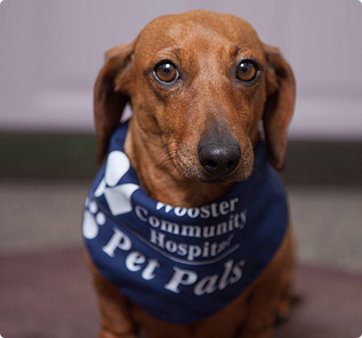 Pet Pals – Emotional support therapy dogs make regular visits to various WCH departments, bringing love, friendship, and a ray of sunshine into the lives of hospitalized patients. For more information about the WCH Auxiliary at Wooster Community Hospital, call (330) 263-8299.